The People’s Bank of China is turning its attention Initial Coin Offerings (ICO), seeking to regulate the new form of crowdfunding. Although cryptocurrency withdrawals are back on the big three Chinese exchanges, the People’s Bank of China (PBoC) isn’t quite through with the cryptoworld. Now it seems like it’s going after Initial Coin Offerings (ICOs), seeking to regulate the new phenomena in the crowdfunding world. Chinese publication Weixin reports that Yao Qian, head of Digital Currency Research Institute at PBoC, has stated that the PBoC will soon regulate ICOs. Initial Coin Offerings or ICOs are a way to fund projects or companies crowdfunding methods. This typically includes selling project tokens for fiat currency, Bitcoin, Ethereum, and other popular cryptocurrencies. These tokens are usually required in order to use the platform or they can also represent equity through a dividend or buy-back program. The news comes at a time where ICOs are extremely popular, gathering millions of dollars every week and amassing higher and higher market caps. Most recently, the Basic Attention Token (BAT) ICO, gathered $30million in a matter of seconds, while the Aragon project gathered $20million in roughly 15 minutes. The MobileGo ICO gathered over $53 million in the course of its month-long ICO. While most ICOs currently take place through the use of the Ethereum network, other projects are also getting in on the action, as is the case of the Waves Platform, Wings DAO, and Ethereum Classic. Although some of these crowdfunding campaigns have had exorbitant returns for investors, many members of the community are also raising questions about the validity of some of these projects and if they are really worth tens of millions of dollars before having even built their project/platform or an MVP (minimum viable product). Although the moratorium on cryptocurrency withdrawals has come to an end, the PBoC has stated that they are not yet done with Bitcoin exchanges. Now, Bitcoin miners in the country are starting to shut down their operations in fear of future regulatory pressure like the one applied to exchanges. The price is so high at the moment. Shutting down costs mine owners hundreds of thousands of yuan every day. In China, the pressure from the PBoC has resulted in a weakened Bitcoin market, strict KYC policies and may now also affect mining and ICOs as well. However, regulation can also be helpful. In Japan, the new regulatory framework built around cryptocurrencies has allowed their popularity to grow in the country. Can the new stance on Initial Coin Offerings by the PBoC change the ICO landscape? The China Syndrome: Are California’s Bitcoin Exchanges Doomed? Increasing regulatory pressures have eviscerated trading volumes across Bitcoin exchanges in China. Bitcoin’s shifting volumes and price are signaling that further disintermediation is inevitable, which could also spell trouble for Western exchanges like Coinbase and Kraken. Increasing regulation of the Bitcoin market in China by the People’s Bank (PBoC) has characterized the first Quarter of 2017. First they banned margin-trading. Then they halted withdrawals of Bitcoin from Chinese exchanges in February. The latest news is that withdrawals are expected to resume soon provided a strict set of KYC/AML conditions are met. The nature of the ban on withdrawals has been widely misunderstood. Note that bitcoins were not trapped. Trading continued the whole time on Chinese exchanges – purchases and sales were allowed. The PBoC never disallowed the withdrawal of cash from Chinese exchanges. So Chinese who wanted to exit could simply sell their Bitcoins and withdraw their renminbi. That said, there were several consequences of the Chinese regulation in the global Bitcoin market. I call this set of results or symptoms that occur in tandem ‘the China Syndrome’. We can expect more and more financial regulators to intervene ever more intrusively into Bitcoin markets globally, and we can expect to see a similar syndrome of effects every time. So, as the IRS demands that Coinbase reveal all its customer records, we can expect the same China Syndrome set of consequences. What were the results of increased regulation of exchanges in China? The share of global trading volumes of Chinese exchanges collapsed. There was terrific disintermediation. Over The Counter (OTC) trading volumes in China exploded. This is trading that is done P2P, off-exchange. The two most popular OTC platforms in China are LocalBitcoins and Bitkan. Bitcoin traded OTC in China has achieved a premium over both the price on Chinese exchanges and indeed over global prices. It is the most expensive Bitcoin in the world! Bitcoin has recently started to trade on LocalBitcoins at a premium to exchanges worldwide where previously there was a discount. The logical endgame of disintermediation is a black market. For example, what naturally happens in an economy such as Venezuela or Nigeria where banks (the middleman) fail to provide the market-clearing price for dollars as a result of capital controls? People will disintermediate their asses and sell on the black market of course! Disintermediation, in finance, is the withdrawal of funds from intermediary financial institutions, such as banks and savings and loan associations, to invest them directly. Generally, disintermediation is the process of removing the middleman or intermediary from future transactions. There remains a powerful need among Chinese to trade Bitcoin that the PBoC cannot stifle. PBoC tries to block one avenue and wily Chinese users disintermediate their way through. It is like the funfair game of whack-a-mole. As the middleman – the Chinese exchanges – was failing to meet the need to freely trade Bitcoin, Chinese users cut out the middleman. Here are two charts to illustrate the extent of the disintermediation. Chinese exchanges have become the sick men of global exchanges, and LocalBitcoins China is experiencing explosive growth.. Note that this second chart greatly understates OTC trading in China for several reasons. One, it’s possible that the Bitkan platform is even more popular than LocalBitcoins in China. Bitkan reported a twelvefold increase in trading volumes in Q1 2017 in this interview with Bitcoinist. Two, once buyer and and seller establish a relationship through LocalBitcoins or Bitkan, those two parties might choose to transact thereafter privately, without using the platform, so saving on escrow and platform fees. Three, you also tend to get P2P Bitcoin deals being negotiated on popular financial and exchange forums, like the Chinese equivalents of Craigslist. This effect has received less attention than the effect on volumes. In Q1 2017 Bitcoins have traded on Chinese exchanges at a significant discount to global prices. 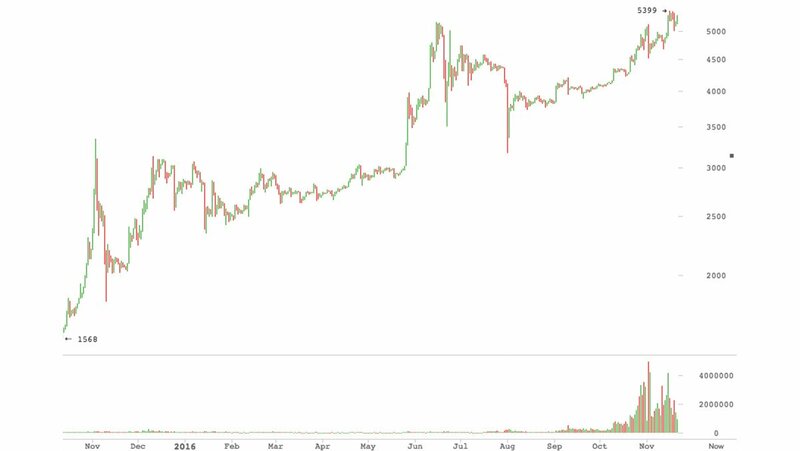 Previously Chinese Bitcoin had always traded at a small premium to the global price. My research shows that a) Bitcoin traded OTC in China has achieved a premium over both the price on Chinese exchanges and over global prices and b) Bitcoin has started to trade on LocalBitcoins as a premium to exchange prices worldwide where previously there had been a discount. Previously analysts argued that there was naturally a discount on OTC markets as a result of the greater convenience that the exchanges offered their clients, and of the greater counterparty risk intrinsic in an OTC trade. But it now seems to be the case that the force is with OTC trading, and that users are prepared to pay a premium OTC to achieve greater privacy and control over their Bitcoins. Exchanges in the San Francisco, Japan and Europe have been doing terrific business in 2017 and the money is rolling into their coffers in the form of trading fees and the income they derive from their Bid-Offer spread. Oh, they are living the life of Riley in San Francisco’s Financial District! Knocking back the $20 libations at Rickhouse Bar on Kearny Street and at Comstock Saloon. They think nothing of buying $75 steaks. The toilets are dusty with cocaine powder. But threats similar to those that have hit the solvency of OKCoin, BTCC etc. await Coinbase, Kraken, Bitfinex and the other big hitters. There will be blood. The future looks rosier for the more decentralized avenues like Bitsquare, whose global volumes have been rising steadily, and for wallets with greater privacy like Samourai. Further disintermediation in Bitcoin trading is inevitable. That is what the shifting volumes and the price mechanism in the Bitcoin market are signaling. And note this: the ultimate disintermediation is black market/criminal activity. For example, drug users disintermediate the failure of pharmacies to provide Grade A meth and crack by buying from the street corner or on Dark Markets. That is where we might buy our Bitcoin 3-5 years from now, possibly from wild-eyed, shaggy-haired ex-employees of Kraken. Do you agree that centralized exchanges will become obsolete and unable to compete with decentralized avenues? Share your thoughts below! Bitcoinist spoke with Leon Liu, the CEO of BitKan, a Chinese P2P Bitcoin trading service, to get a better idea on the current situation following the recent regulatory clampdown on Bitcoin exchange withdrawals in the country. Bitcoinist: What kind of trading services does BitKan provide? Leon Liu (LL): BitKan provides P2P bitcoin trading services with broker match-making to save time for our users. During a trade, BitKan acts as an escrow service, guaranteeing funds delivery for both sides. Users can also trade small amounts in five minutes. Bitcoinist: How has the recent restrictions imposed by the People’s Bank of China (PBoC) on crypto-exchanges impacted your operations? LL: The PBoC focused on the three biggest exchanges. PBoC actions did not have any impact on us because it focuses on money laundering, currency outflows and pyramid schemes. We do not provide such services to our customers. That’s why we weren’t impacted. Right now, customers can use our platform to withdraw Bitcoin after 3 days. Bitcoinist: China’s overall Bitcoin trading volume has seen a significant drop due to these PBoC inspections. Have traders gone abroad or have they simply moved off-exchange and into P2P and OTC markets? Have you seen an uptick in P2P, OTC trading as a result? LL: There are two kinds of customers: the first kind buys bitcoin and uses it. So, they need to withdraw bitcoin. Yes, some of these people went to other small markets, where withdrawals weren’t suspended. Some went to the OTC market. It is difficult for Chinese people to access foreign markets. Therefore, these customers cannot buy Bitcoin abroad using CNY. Also it is difficult to exchange CNY to USD in China. Our volume grew by twelve times [since withdrawals were suspended]. The second kind of customer trades bitcoin, buying and selling it to earn a profit. In fact, most people speculate with the price this way, and then they withdraw CNY. And yes, our volume grew by twelve times. Bitcoinist: Who is your typical customer? LL: We have two kinds of customers. Those new to bitcoin and who buy their first bitcoin on our platform; and then there are users who already have basic knowledge about bitcoin and who do not want to trade on exchanges. Bitcoinist: How does your P2P trading service compare to the increasingly popular LocalBitcoins, for example, which has seen exponential growth in China following the suspension of withdrawals? LL: The first step for our customers is registration via email. If they want to trade on our platform they need enter their cellphone number. If users want to trade more that 5 BTC a day – they need to comply with KYC and AML guidelines. The difference with LocalBitcoins is that BitKan offers a mobile phone app that is easy to use. Second, all traders must go through the KYC process, to ensure safe trading. Third, trading is faster than on LocalBitcoins and a trade can go through within a minute. Fourth, BitKan is better localized for the Chinese market compared to LocalBitcoins. Bitcoinist: So customers can buy up to 5 BTC with just their email address? LL: Yes, the maximum is 5 BTC without having to submit any personal information. Bitcoinist: Do you agree with BTCC CEO Bobby Lee that Bitcoin is not being used to bypass Chinese capital controls – that it’s mostly hype created by the media? LL: We agree with Bobby Lee. This goes back to 2013 when the government said that Bitcoin is a commodity. It can not be used by companies for payment. Now, Bitcoin is used mainly for two things in China – mining and trading (speculation). Bitcoinist: Bitcoin mining giant BitMain invested $1.6 million into your platform last year. What have you done with these funds so far and what are your future plans? LL: We spent the investment on global promotion and development. In the future, we are going to roll out our OTC business globally. Segwit will not be the best solution for Bitcoin scaling, it will make the Bitcoin network more complicated. Bitcoinist: Bitmain is a supporter of the Bitcoin Unlimited scaling proposal. Where do you stand on this issue in the scaling debate? LL: We support Bitcoin scaling first and foremost, but we do not support a fork. We hope that the parties can reach some agreement. My personal opinion is that SegWit [Segregated Witness] will not be the best solution for Bitcoin scaling, it will make the Bitcoin network more complicated. Bitcoinist: Finally, how is your planned expansion into the US market coming along? LL: This is still in the early stages, but we are making some progress. The USD market is now the second biggest for BitKan. The US has different regulatory policies across different states, and BitKan will comply with these laws accordingly. Will the Bitcoin OTC and P2P trading continue to grow in China? Let us know below! The post Virtual Currency Issued By PBOC Will Not Use Blockchain Technology appeared first on Bitcoinist.net. The governor of the bank, Xiaochuan gave strong opinions regarding the subject of permissionless and permissioned digital currencies. He believes the central bank adds a framework of security, social order, and regulatory policy. All of which the central banker feels would be a better architecture for digital currencies. Xiaochuan states, “We think, therefore, as a legal tender, digital currency must be issued by the central bank. The issuance, circulation and transaction of digital currency will follow the same management principles of traditional currency.” However when it comes to the creation of a centralized digital yuan, the governor says they have no roadmap. He believes it’s going to take some time to issue a technology and for it to gain some adoption. Cash will coexist with virtual money for quite some time Xiaochuan says, but the cost associated with cash will rise. The PBOC representative then goes into the subjects of monetary policy with cryptocurrencies and the 51% attack topic with Bitcoin. He believes that the beginning stages of regulatory improvements will take time with digital currency adoption and one issued by the central bank will significantly improve. Xiaochuan explains, “The security and efficiency of issuing and withdrawing digital currency will be significantly improved in the end.” With problems like the 51% attack, Xiaochuan says that’s a Bitcoin problem and would have a hard time happening in a centralized atmosphere. The governor considers the theory a “hotly debated” topic and a digital currency created by the PBOC would differ immediately from its inception. The interview revealed that the PBOC and the executives working there have a great understanding of what’s happening in the cryptocurrency and blockchain world. Central banks are very aware of the disruption of the current money system as we speak, including the vast number of smaller legacy institutions operating under them. Time will tell what the PBOC will do with the creation of a digital yuan. Will it be a cryptocurrency like Bitcoin? Probably not. What do you think of the People Bank of China Governor’s statements? Let us know in the comments below. The post PBOC Governor Speaks About Digital Currencies appeared first on Bitcoinist.net. Financial trouble has been brewing in China for several months now, and traditional stock markets remain very shaky ground for the time being. Keeping in mind how the Chinese economy will affect nearly every other country in the world, things are not looking overly positive right now. By the looks of things, global lenders are not that confident in the Chinese economy anymore, which could lead to further turmoil down the line. Even though the People’s Bank of China has taken several measures to fight further downfall of the stock market, their efforts seem to be in vain for the most part. On top of that, global lenders are losing confidence in the country’s plan for recovery, as there has still not been any form of proposal from government officials. Needless to say, this growing uncertainty could easily lead to further devaluation of the yuan. When a country’s financial situation is on the brink of collapsing, it is the sole responsibility of the central bank and government officials to devise a strategy. So far, that has not happened, and it is making investors and other financial players very nervous. The Chinese yuan has been losing a fair share of its value for several months now,and it still remains unclear as to whether or not this downward trend will continue over the weeks to come. Some financial experts see the delay in coming up with a solution as a covert plan to further weaken the yuan in favor of their new trade-weighted basket of currencies. In December of 2015, the People’s Bank of China made several financial interventions to stop capital outflow. Even though the official number of money spent by the bank remains unknown to this very day, some experts estimate it at US$140 billion. It goes without saying that PBOC has been sacrificing a large portion of its foreign exchange reserves, to little avail. It remains impossible to predict what would happen if the Chinese yuan would be faced with another devaluation in the near future. One thing’s for sure though: the financial shockwave will be felt by all countries around the world. Zones such as Japan and Europe are already weakening their currencies, and another major hit could send both economies in a death spiral from which they will not recover any time soon. Chinese government officials will have to come up with a plan to reform their financial structure and create a more transparent ecosystem. Right now, China’s financial system is obscured from the rest of the world, as information is very difficult to come by. Furthermore, the country’s excess industrial capacity will need to be addressed as well. Based on several statements published in a recent Telegraph UK article, it looks like China is running out of funds rather quickly. With an estimated US$600 billion left in reserves that can be spent whenever needed, there is very little headroom for another disaster. If this funds were to dry up completely, things could get very uncomfortable for China. If the government and central bank had properly diversified their portfolio, a part of this crisis could have been averted. Rather than relying on traditional financial instruments, diversification with Bitcoin is an interesting alternative. In fact, the central bank of Barbados might be eyeing bitcoin as a way to diversify their asset portfolio at some point in the future. What are your thoughts on the ongoing debacle in China? What will the result be? Let us know in the comments below! The post Bitcoin Hangs In There While China Faces More Financial Worries appeared first on Bitcoinist.net.